A Polar Bear Plunge fundraiser was held this past Saturday at the Yards Park, it was a day filled with fun and unique activities made even better since it was for a good cause. 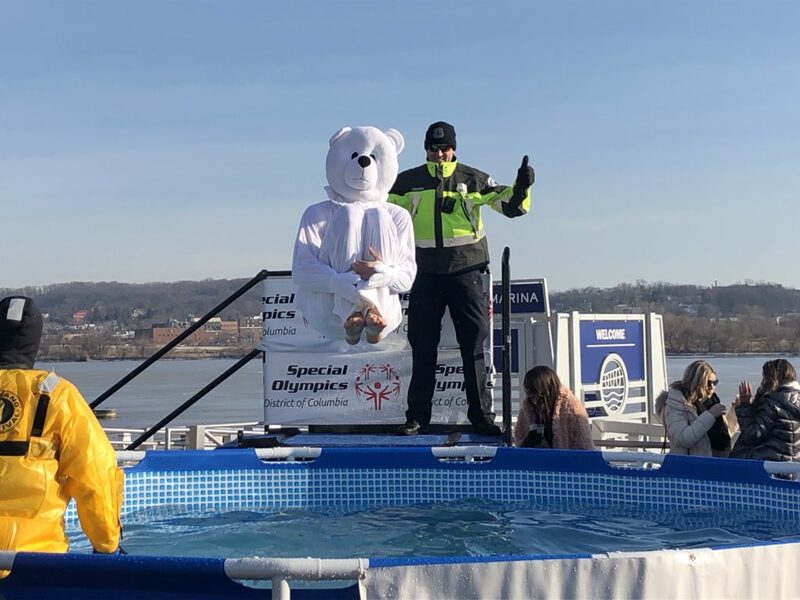 The Ice Yards, named the “event of the winter season, with revelers enjoying an unparalleled afternoon”, according to the Capitol Riverfront website, teamed up with the national organization for the first time to raise money for Special Olympics. The event featured ice sculptures, a cannonball contest, ice games, food from the local restaurants, and much more. With the purchase of a ticket, a person was given all-access to the event and, if they were of age, a complimentary beer or wine. Not only did the event have a live band, but there was a dance floor for all the patrons to show off their moves. The Ice Yards lived up to its name with an ice sculptor making a series of different sculptures, including a polar bear, a throne, and an ice board where visitors could write their names using an ice saw. This is the first year that the Polar Bear Plunge was held in the Yards Park, as the previous location was the Nationals Park, home of the Washington Nationals baseball team. The Plunge was made possible through partner organizations including Wawa and 107.3FM, and hundreds of individuals raising money on their own. Team Brookfield, a group of 21 people, raised $39,500. Groom Law Group, a group of 16 members, raised $32,817. Individual participant Robert Sweenes raised $6,843. If you are interested in getting involved with the Polar Bear Plunge or would like to donate, more information can be found here.